We are excited to announce our upcoming exclusive video training series. We’re calling it: Better Meetings with Surface. Yes, that means more productive meetings for you and your team, no matter how big or small. The computer has changed the way we work. It has helped us to get more done in less time, increasing productivity. Now, there is an even more efficient way to work. Using Windows 10 software on a tablet PC like the Surface Pro, workplace productivity increases dramatically. No longer are you chained to the confines of a keyboard and mouse. As a result, you are able to achieve a level of productivity like never before. How can your workplace benefit from using a Surface Pro? How can you conduct more productive meetings? Enter: Better Meetings with Surface. Mat and I are both recognized Microsoft MVPs. We travel the country training Australia’s largest companies and government agencies on the Surface Pro. We help our customers become more productive on their tablet PCs. Often, people don’t know what they don’t know. Training is an essential part of successfully implementing tablet PCs into any workplace. By the end of our training, customers are taking meeting notes, marking up documents, video conferencing, collaborating and sharing ideas and rich content on their devices. Our unique training addresses far more than just programs and features. It is designed specifically to deliver lasting and productive change to personal and business productivity. Now, we’re making this training available to you! Why not take advantage of it? Unlike our video series Be A Surface Pro, this series is exclusive to Tablet PC customers. To gain access to Better Meetings with Surface, just purchase a Surface Pro 4, Book or Studio from us. Yes, it’s that simple! Allow us to help you move beyond the mouse and keyboard to achieve a level of productivity like never before. Stay tuned for our first video coming soon! Why Buy Surface Pro 4 or Surface Book from Tablet PC? 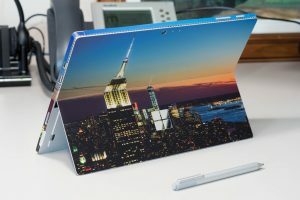 Surface Tablet or Pen and Paper?